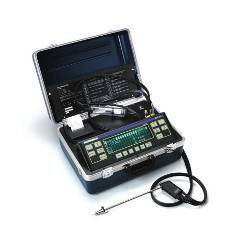 Bacharach PCA3 265 Portable Combustion Analyzer Kit for Oxygen (O2) 0.1-20.9%, Carbon Monoxide (CO/H2 compensated) 0-4000ppm, Nitric Oxide (NO) 0-3000ppm and Nitrogen Dioxide (NO2) 0-500ppm. Full color display. B-Smart replaceable sensors. Up to ten different fuels. ABS Housing. Alkaline Batteries powered. With Printer. CE Approved. Bacharach’s all new PCA ® 3 is the definitive combustion and emissions analyzer that enables fast and accurate measurement for on-demand or semi-continuous sampling of light industrial, institutional, commercial and residential furnaces, boilers and appliances. 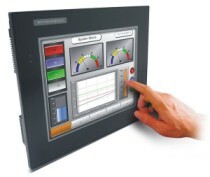 Exclusive B-Smart ® plug-and-play sensor technology makes calibration as simple as pushing a button. The Bacharach PCA ® 3 is the perfect tool for service technicians and boiler contractors who need to ensure safe operating conditions, determine combustion efficiency and perform emissions testing. This lightweight handheld combustion and emissions analyzer directly measures and displays Flue Gas Oxygen (O2), Carbon Monoxide (CO), Stack Temperature, Draft, Differential Pressure, Combustion Air Temperature and optionally measures and displays Nitric Oxide (NO), Nitrogen Dioxide (NO2) and Sulfur Dioxide (SO2). The PCA ® 3 simultaneously calculates and displays Combustion Efficiency (EFF), Excess Air (EA), Carbon Dioxide (CO2), NO x and Oxygen reference values. Plus, the PCA ® 3 performs combustion calculations for ten different fuels and can measure 4 gases simultaneously from a choice of up to 6 field-upgradable electrochemical sensors. With its large, vibrant color display, reading combustion and emissions test results in any work environment has never been easier! > COMBUSTION > OXYGEN+CO+NO+NO2 : 2 Items found. 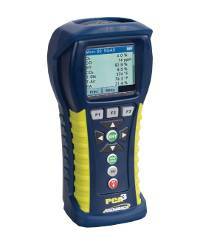 Bacharach PCA3 265 Portable Combustion Analyzer for Oxygen (O2) 0.1-20.9%, Carbon Monoxide (CO/H2 compensated) 0-4000ppm, Nitric Oxide (NO) 0-3000ppm and Nitrogen Dioxide (NO2) 0-500ppm. Full color display. B-Smart replaceable sensors. Up to ten different fuels. ABS Housing. Alkaline Batteries powered. CE Approved. 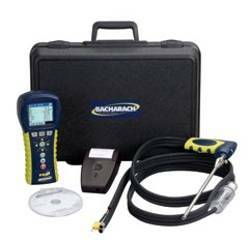 Bacharach ECA 450 Combustion Efficiency & Environmental Analyzer NOx KIT for Oxygen (O2) 0.1-20.9%, Carbon Monoxide (CO/H2 compensated) 0-4000ppm, Nitric Oxide (NO) 0-3500ppm and Nitrogen Dioxide (NO2) 0-500ppm. Compact sample conditioner. Large and easy to read display. 100-240V input. Stores over 1000 test records. Draft, Stack Temperature, built-in printer and 12" sample probe w/15' hose assembly. EPA/ETV Test Verified.